"If the homily goes on too long, it will affect two characteristic elements of the liturgical celebration: its balance and its rhythm. The words of the preacher must be measured, so that the Lord, more than his minister, will be the center of attention." HE SUCCESS of our yearly conference has exceeded anything we could have imagined. With gratitude to the Lord, we announce our fourth Sacred Music Symposium, designed especially for—but certainly not limited to—choir directors. Those who sing at either form of the Roman Rite (Ordinary or Extraordinary) won’t want to miss this! HIS YEAR’S THEME is “Hymnody and your volunteer choir.” Participants will learn clever ways Catholic hymns can be sung during the sacred liturgy, as well as different compositional techniques for hymns. Participants will sing for the first Mass of a newly-ordained FSSP priest, which will take place on Thursday Evening (27 June 2019). The setting will be Palestrina’s Missa Jam Christus, which is based on a famous hymn tune. The “Agnus Dei” will be the exquisite Mille Regretz (6-voice) by Fr. Cristóbal de Morales. Participants will also sing for Solemn Vespers with His Excellency, Bishop Joseph V. Brennan, including a polyphonic setting of the MAGNIFICAT by Francisco Guerrero. Participants should travel to Los Angeles on Sunday night or Monday morning. The Symposium begins Monday evening (24 June). 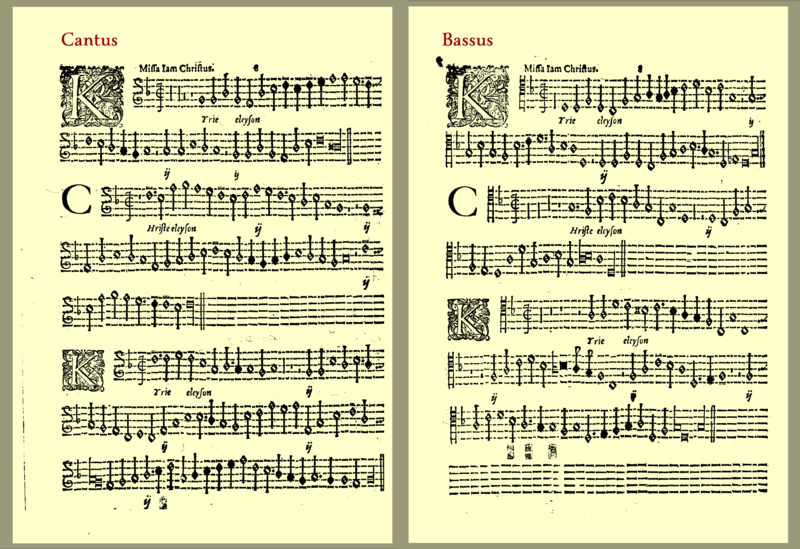 (6) Gregorian Chant “Crash Course”—how to implement it without getting fired|! (9) Survival tips, repertoire ideas, and encouragement for succeeding in what is without question a very challenging vocation. To obtain an application, send an email to dom.mocquereau@gmail.com. The entire cost of the Symposium—which includes deposit, conference fee, and meal plan—is just $275. We call it the “everything fee.” Please submit your application no later than 25 April 2019. The absolute best part of the entire Symposium for me, however, was the glorious Solemn Mass on the last day. The “proof” was right there—the liturgy done properly and beautifully is the ultimate catechesis for me. The reverence of the clergy and the music and the clear emphasis on the Eucharist as “source and summit” brought me to tears many times in that Mass (I confess, I was not able to sing the “Agnus Dei” through my tears, even though it was one of my favorite pieces!) I am now convinced that it is vital to restore sacred music and proper liturgical practice, particularly in the Ordinary Form, in which I work. I was already receiving that direction from prayer, my pastor, and my research, but now I have a new fire underneath me. I feel renewed and ready to do my part! Today, I just got back from a full five-day symposium on Sacred music, inspired by conversations with fantastic and very experienced conductors and composers Jeffrey Ostrowski, Dr. Kevin Allen, and Dr. Horst Buchholz, to what I can say was the most incredibly musical immersion of my life. It was an experience that was uplifting and not condescending: a new direction for the next steps. It was witnessing commitment, love, dedication, and hard work put in Sacred Music. It was meeting people with the same mind: that Sacred Music is serious work and not a hobby. It also shows that it is worthwhile “complicating” our lives for God. Thank you Andrea and Jeff for making this possible with all of your help. Thank you Corpus Christi Watershed. Now it’s time to get that music moving! What an amazing and unforgettable experience the 2018 Sacred Music Symposium was! I was able to participate in singing the most beautiful sacred music with many other wonderful Catholics from around the world; a rare opportunity for me. The conferences provided many helpful tips and ideas for both choir directors and choir members. I came home in high spirits and motivated to continue doing my work as a voluntary choir director. 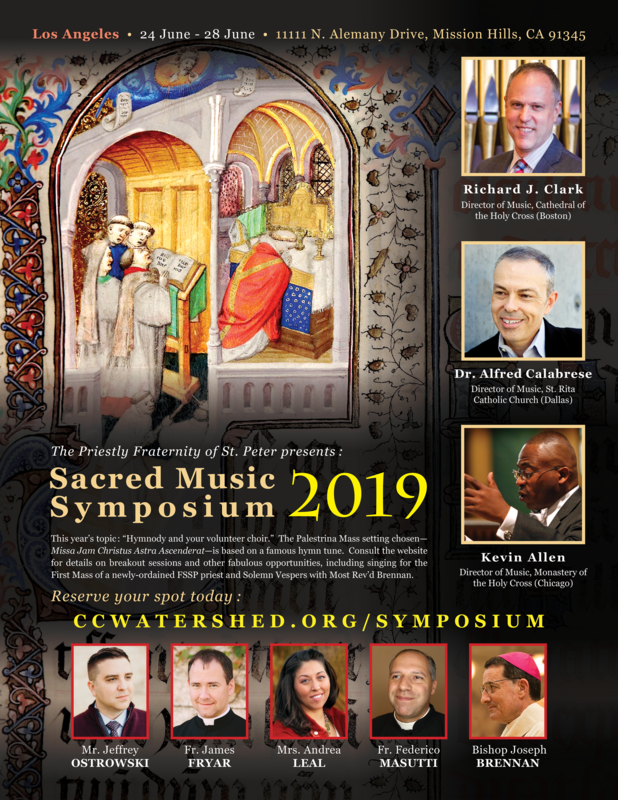 I look forward to attending the next Sacred Music Symposium. It is too awesome an opportunity to miss. Thank you to all of you who helped coordinate this wonderful event and may God bless you! It was the most wonderful experience I have had in a long time, for it both introduced me to knowledge which I could not otherwise easily acquire, and also connected me with the most wonderful people who brought a taste of the strength of the medieval musical school to the present day. I will be processing it for a long time, and hope that I will be able to retain even a fraction of the experience. I’m back from an absolutely wonderful week of Sacred Music with Corpus Christi Watershed and Los Angeles FSSP. It was so great to be able to learn so much ancient and new music that is part of the history of our Catholic Faith. I learned so much about music theory, chant, and technique. Even though I feel like I don’t know very much, it has inspired me to learn more! What’s more, I got to meet so many amazing and wonderful young people who are dedicated to their faith! It was a pleasure to meet them and talk about all sorts of things from Latin, to Theology, to the Mass, to school, to vocations, and even goats! God bless you all and I look forward to next year’s Sacred Music Symposium! I will be forever grateful to Mr. Ostrowski, Mr. Allen, Dr. Buchholz, Fr. Popplewell, and all the organizers of the Sacred Music Symposium for the knowledge, experience, and help they have given me. Thank you also to Fr. James and Fr. Ken Fryar, all the FSSP Seminarians, and the altar boys. If you enjoy singing Catholic music, conducting, or composing music, I highly suggest you attend next year’s Sacred Music Symposium! You will have an experience never to be forgotten!!! What a symposium! I had high hopes for the quality of the music and lectures, but even those expectations were exceeded. I don’t even know where to begin… The lectures were incredibly packed with information and helpful for the choir director trying to navigate his music program to greatness, which is what Our Lord deserves. What I really appreciated was the wide diversity of topics, ranging from the theoretical to the practical, from the academic to the “real world” problems encountered in music ministry. The lecturers were engaging—and all brought their own unique contributions to the table—providing us with a rich feast of information to digest at the conference and beyond. My favorite topics were the children choir lectures, the music theory sections, and the repertoire portions. I am also grateful for the spiritual renewal it brought about. I had fallen into a slump with regards to music ministry because I lacked direction and faced some discouraging obstacles. Having tasted beauty itself in the elegant duet of silence and music at the Masses and the solemn Vespers, I left with a sense of peace and a burning desire to steer the liturgy towards contemplation once again. I rediscovered an old love thanks to all the efforts and prayers associated with the symposium. God bless you for this precious gift! I have been blessed to attend the Sacred Music symposium for the past three years. Listening and singing with the many young people who attend is a privilege and tells me that there is hope for retaining this precious gift of sacred music. We can be assured that our valuable Catholic treasury of music and art will be preserved and in time brought into the Ordinary form with their expertise. These young people have been singing & learning solfege, conducting, learning to play organ, forming small choral groups and teaching others. All have amassed an incredible wealth of good solid repertoire. I applaud our sponsor FSSP and organizer Jeff Ostrowski for continuing their mission to bring sacred music to the forefront, to educate us on what is truly sacred and why. My experience with the Symposium was far beyond of what I could imagine, the night I saw the event article on the CCW site, I did not think twice and sent an e-mail to apply, even though I live far away from the location it was going to take place, I knew that somehow I would have to be part of this. Talking with Andrea during the process of application, answering doubts, solving the dormitory made things so much easier and took a great weight off my shoulders in adventuring into the unknown. The first day I was greatly impressed at the number of young people dedicated on bringing the sacred back to our liturgies, how hardworking they were as if their lives depended on it—talent isn’t enough!—these hardworking young people have a clear sight in mind, be apostles of the church through their voices. The hospitality of the faculty mixed with the spiritual bond that united us made this Symposium something I will never forget. Beginning the day with a Low Mass in an improvised classroom chapel made me realize how the Mass even when is stripped to a bare minimum and more importantly celebrated devoutly can bring such many graces to the ones who are hearing the priest’s prayers, the different classes and talks during the week had so many information packed in that my brain felt it was going to explode, probably sounding like one of Victoria’s Masses, learned so much by watching the conductors mold and perfect to the littlest details of a piece to bring forth a magnificent sound worthy of, keeping the distance, the choir of angels who sing to the Lord a new song according to their virtues infused in their nature, just as that, every participant, being entirely different from the other united their virtues and offered to the Lord this unity made possible by the consuming fire of the Holy Spirit in which we, the Mystical Body of Christ sing in “una voce”. Every day, finishing with sung vespers was something I could not wait to show others, the way the psalms were resonating the spirit being felt during the event, the different antiphons with completely different meanings from one to the other made sense as a whole, perfected our work during the day by the offering of the Church’s praise. At the end of the week, during the extravaganza and subsequently the Mass, everything clicked, the hard work during the week made sense, the 4 daily cups of coffee finally made their effect…the things we were so nervous about, waiting anxiously for it to come, was here, and, Oh man, thanks God that made me wait so long, because I would not realize the meaning and purpose of sacred music viewed in the context of Church’s history and especially the Mass. Everything flowed, we were one in Christ that whole week and I give thanks to the Lord for allowing me to have this amazing experience, my prayers goes to everyone involved in this event, to the carmélites who hosted it in their school, and the FSSP for sponsoring it! Thank you Jeff, Kevin, Horst, Andrea, Fr. Popplewell and everyone involved in this, may God give you many graces to keep up the good work. When I decided to attend the Sacred Music Symposium, I was seeking an answer—a prayer of hope to rekindle the flame of love and affirm my decision in music ministry. Jeff Ostrowski is genuine and touched my heart. His talks grasped the real struggles and frustrations the church musician endures and provided a treasure of tips and knowledge to cope with the challenges. It was an affirmation and consolation of hope that lifted the uncertainty from my heart, and I found the answer I was seeking: Sing, Sing, Sing!!! But nothing could have prepared me for the grandeur of singing a Mass by Francisco Guerrero under the helms of Dr. Calabrese and Dr. Buchholz because they made it so simple and yet extraordinarily magnificent as they steered the choir with poignant understanding of breathing techniques, pronunciation, and total surrender from the heart. Dr. Buchholtz and Meaghan King’s superb organ playing finally ignited the flame. Watching them play and listening to the pipe organ was absolutely magnificent. Thank you for allowing me to sing among the stars to honor the Mother of God on her Feast of the Queenship of Mary. And may God continue to bless ccwatershed—a wonderful apostolate. The Symposium was wonderful. I have attended similar programs in the past, but what set this experience apart was that the Faith was at its center. Being surrounded by like-minded Catholics for five days was refreshing, and singing the most beautiful music in the world—with dozens of wonderful individuals who cherish the rich body of Tradition and meaning behind it—was truly lovely. It was like being in virtual heaven for the length of a work week.